GEEE 2018: Galgotias University conducts the Galgotias Engineering Entrance Examination (GEEE) every year in the month of June. We are concluding that the Galgotias Engineering Entrance Exam 2018 will be conducted in June 2018. GEEE is conducted for enrolling new candidates in the Galgotias University Classroom Engineering courses for pursuing their B.Tech degree in various streams. The Galgotias University comes under the category of well-recognized institutions for pursuing Engineering studies. For getting admission the candidates need to qualify GEEE 2018 Admission Test whose online application submission will be carried between January to May 2018. Applicants meeting the eligibility norms in all the aspects are invited to register online by submitting the GEEE Application Form 2018 on or before the last date by following the step-wise procedure given below. 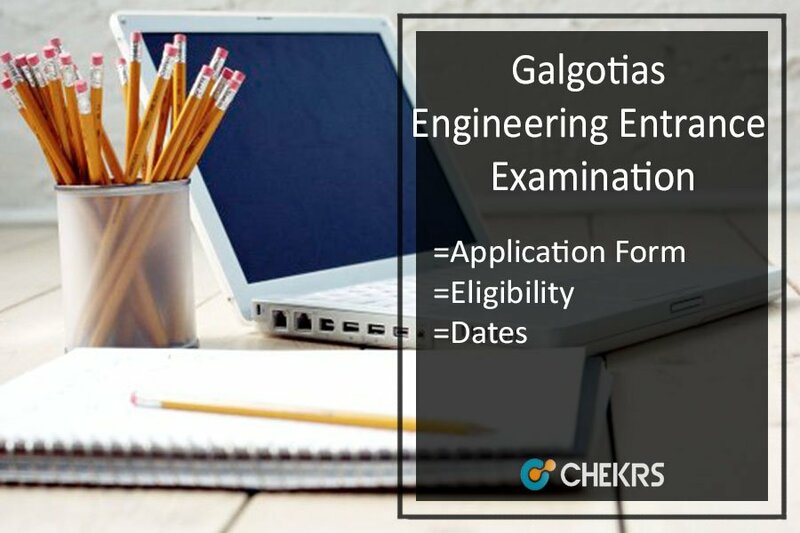 The Galgotias Engineering Entrance Examination 2018 will be conducted in June 2018 for enrolling the candidates in Galgotias University for pursuing their B.Tech degree. Visit the official website, i.e. geee.in/. Search for the “apply online” link and then click on it. Then you are provided with the online form all the required documents as per the requirement. Pay the required application charges through suitable payment mode. Click on the submit key after cross-checking all the filled entries. Applicants need to pay Rs. 930 as application fee + Examination fee. The application fee can be paid through Debit or Credit card. The candidate should have scored minimum 50% marks in 12th board. The Questions will be asked from the syllabus of class 12th Physics, Chemistry, and Maths section. You can follow the direct link just below for accessing detailed information about Galgotias Engineering Entrance Exam Syllabus 2018. The question paper of the exam will be provided only in the English language. All the students need to check the sample paper of the exam. By this paper, students can take an idea of the upcoming exam paper. The GEEE Model paper helps you to find out the pattern of the exam and from which part most of the questions will be asked. Students can also see the previous year exam paper to practice for the exam. Candidates will be able to download the GEEE Hall Ticket 2018 by the last week of June 2018. The Admit card will be available only for those candidates who have successfully applied for Galgotias Engineering Entrance examination. All the candidates should keep in mind to carry the exam call letter in the examination center as it is treated as the proof of successful application and applicants authenticity. If you don’t have GEEE Call Letter 2018, you will not be allowed to sit in the examination hall. The candidates who have successfully appeared in the Galgotias Engineering Entrance Exam will be able to check GEEE Result 2018 in June 2018. We will make you available with the direct link from where you can easily check your result just after the official result announcement.